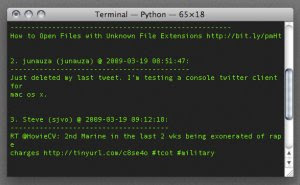 After showing everyone how to easily use Twitter from the Linux command line, let's head over to the Mac OS X terminal and share to all the Mac users out there a somewhat geeky way on creating and retrieving tweets. 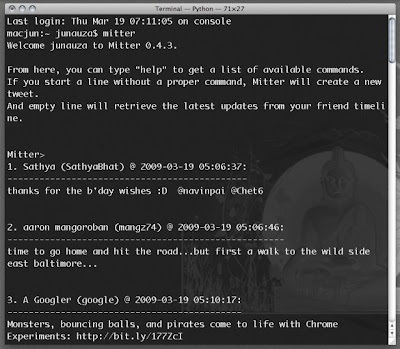 Once logged in, you can retrieve the latest updates/tweets by simply leaving the line empty and pressing "return (enter)", or create/post a tweet by not leaving it blank. If you have some questions regarding this “how-to”, please don’t hesitate to drop us a comment. I am getting this authorization error. This is on Mac OS 10.5.7. I can log in to my account on twitteriffic and on the twitter page. Twitter, have changed the api, and now this library fails. The lib should use xAuth or oAuth instead of basic auth.